In spite of being called “Trio” Sonatas, Bach’s works now identified as BWV 525-530 were first published as solo pieces for the organ. According to Bach’s first biographer, Johann Nikolaus Forkel, these “Six sonatas or trios for two keyboards” (i.e. the two manuals of the organ) “with obbligato pedal” had been composed by Bach “for his eldest son, Wilhelm Friedemann”, and had a pedagogical, along with an artistic goal. “By practising them”, Forkel claims, Wilhelm Friedemann “prepared himself to be the great organist he later became”. Forkel also adds a significant aesthetic judgement: “It is impossible to say enough about their beauty. They were written when the composer was in his full maturity and can be considered his principal work of this kind”. Though they constitute today a cornerstone of the organists’ repertoire, it is true that some of them are Bach’s own reworkings and arrangements from previous works. In their definitive form for the organ, these Trio Sonatas were probably written between 1727 and 1730, during Bach’s time in Leipzig; however, the known sources of some of the movements composing them are numerous, and comprise a Concerto for flute, violin and harpsichord (BWV 1044) as well as the Symphony opening the second part of Cantata BWV 76, but possibly other original instrumental and chamber music pieces were rewritten by Bach with the purpose of giving a definite and consistent shape to this beautiful collection. If Bach, then, felt free to transcribe from varied instrumental mediums in order to create his organ masterpieces, later musicians felt equally free to do the same with his works, and to transform them into chamber music pieces. Indeed, Bach seems to have had a particular interest in the timbre of the flute, which is in fact evoked by some of the most soft-sounding and ethereal of the organ stops. 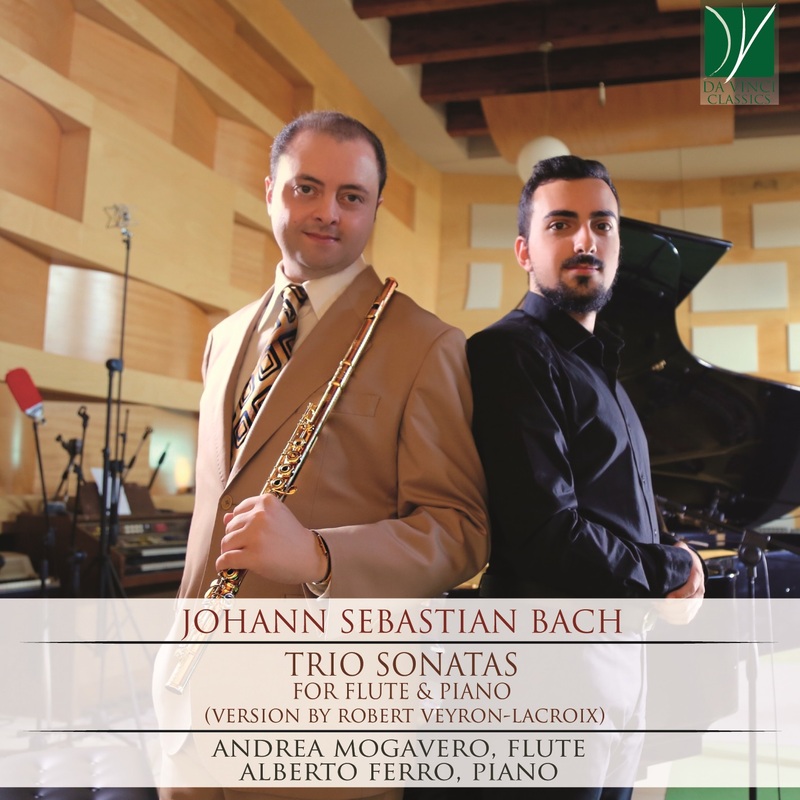 Moreover, Bach was well acquainted with the particular features of flute playing and technique, also by virtue of his experiments in the years immediately before the supposed composition date of the Trio Sonatas, which culminated in his original Flute Sonatas. It is in fact possible that one of the greatest flutists of the time, the Dresden court musician Pierre-Gabriel Buffardin, spent some of the summer months of 1724 in Leipzig, and likely became acquainted with Bach and his music. A supporting element in favour of their cooperation is that Bach’s Cantatas dating from that period feature prominent flute parts, which Buffardin may have played as a soloist. Buffardin is also remembered as the teacher of Johann Joachim Quantz, who not only was in turn among the leading musicians of his time, but also left a fundamental treatise, On Playing the Flute (1752), from which invaluable information about Baroque performance practice has been transmitted to our times. After Bach’s death, knowledge of his music and of his figure was quickly confined to a restricted circle of professionals, who were able to appreciate the masterly features of his art; the larger musical world quickly forgot about him, and his music was generally neglected. In this bleak panorama, a few “Bach-cities” provided laudable exceptions to the rule, particularly thanks to enthusiastic individuals who cherished Bach’s music and disseminated it among their pupils and acquaintances. One of these “Bach-cities” was certainly Dresden, where a virtually uninterrupted “Bach-cult” is observed. Among its promoters was Moritz Fürstenau (1824-1889), who had studied the flute in Munich with Theobald Böhm, who had created and developed the modern flute. Fürstenau, who was an admirer and supporter of his contemporary Richard Wagner, had also the merit of rediscovering or keeping alive the tradition of older music, and was famous for teaching Bach’s Flute Sonatas to his students in the 1860s, at a time when few other flute teachers could be said to do likewise. Indeed, France, the fatherland of Buffardin and of many other of the leading flutists of the 18th-19th century, was one place where Bach’s flute works were seldom taught or performed. This was also due to a lack of performing material: only in the 1860s were Bach’s Flute Sonatas included in the Bach-Gesellschaft Ausgabe (those with continuo accompaniment would have to wait until 1894, while the Trio Sonatas for the organ were published in the same edition in 1867), and at about the same time the Leipzig-based Peters publishing house issued what is considered the first instructive edition of BWV 1030-1035. Significantly, the first French instructive edition appeared only in 1925, for Durand Cie., with performing indications by Louis Fleury (1878-1926), a former student of Claude-Paul Taffanel (1844-1908) and the dedicatee of Debussy’s Syrinx. Taffanel, who is the acknowledged founder of the modern French flute school, was in turn one of the first to perform Bach’s Sonatas, pioneering the rediscovery of Baroque music for the flute in the late nineteenth century. In spite of this, the enormous treasure of eighteenth century flute music remained mostly neglected, and only exceptionally performed in public concerts (one exception being Bach’s Second Orchestra Suite, which soon gained a place in the standard repertoire of the twentieth century). It can be said, therefore, that the merit for the flute “Bach-Renaissance” can largely be attributed to Jean-Pierre Rampal (1922-2000), who popularized Bach’s works in his capacity as a star performer, an appreciated editor, and a leading teacher. Rampal, the son of another flutist from Marseille, started his career as an orchestra performer but gained overnight fame thanks to a live broadcast at the French National Radio in 1945. The following year, at the Conservatoire of Paris, Rampal met with pianist and harpsichordist Robert Veyron-Lacroix, with whom he established a lifelong duo performing worldwide. Indeed, the Rampal/Veyron-Lacroix duo was the protagonist of a previously unheard-of initiative: in 1949, they rented the Parisian Salle Gaveau and performed there what is considered to be the first public recital of flute chamber music, thus gaining acceptance for this repertoire on the same footing as violin or cello Sonatas. This programme featured, among others, Bach’s G-minor Sonata, as well as contemporary music. Rampal, thus, was able on the one hand to become the first internationally acclaimed and worldwide famous flute soloist, and, on the other, to influence deeply and to significantly broaden the standard repertoire for his instrument. He was a passionate researcher and rediscoverer of forgotten works, particularly of the Baroque era; he maintained that the transparent beauty of Baroque music was almost therapeutic for a world which was slowly and dolefully emerging from the catastrophes of World War II. Between 1947-1950, Rampal was the first to record the whole set of Bach’s Sonatas for Boîte à Musique (individual Sonatas had been recorded by Réné Le Roy, Georges Barrère and Georges Laurent in the 1930s), and he frequently performed them as a mini-series of two Bach recitals. Rampal’s fascination for Baroque music did not limit itself to Bach, however; he studied Quantz’s treatise carefully, performed works by many other Baroque composers, and founded the Ensemble Baroque de Paris whose activity lasted for more than thirty years. Rampal also transcribed Bach’s Trio Sonatas from the original scoring for the organ into duos for flute and a keyboard instrument, which he recorded with Veyron-Lacroix in the late 1970s. He also contributed to the dissemination of these works through his teaching (the leading flutists of the following generation were mostly his students) and through his fundamental editorial activity. Even though he was a thoughtful performer and fastidious researcher, Rampal always performed Baroque music on modern instruments, proudly employing all of the expressive and technical resources of his famous golden flute in the service of his artistic view of Bach’s music. Similarly, his editions have no claim to a philological approach to editing, and are admittedly “instructive editions”, conveying, through musical notation, interpretive suggestions, technical advice, performance ideas and aesthetic perspectives of the editor. The enthusiasm for Baroque music, prompted also by the pioneering activities of musicians of Rampal’s standing, encouraged in the following decades the emergence of the “historically informed performance” movement, which employed period instruments and refrained from using editions other than the most up-to-date Urtext. To record Bach’s Sonatas today on modern instruments and using Rampal’s edition as the reference text is, therefore, an operation which might at first make more than one eyebrow raise. In fact, this is not an ingenuous choice which deliberately ignores the latest discoveries of the authenticist field; rather, it is the latest development of this same authenticist movement. By this view, Rampal’s transcription, played on the modern flute and piano, is seen as a work of art in itself, as a creative engagement with Bach’s works which produces an interpretation whose historic and aesthetic importance cannot be underestimated. For generations of flute players, Rampal’s performances and his edition were the lens through which Bach’s works were first known, approached and studied. To perform on these editions today, therefore, is to critically and creatively engage with a tradition to which, on the one hand, we are all indebted for making Baroque music part of today’s musical landscape, and, on the other, must be historicized in turn, after nearly three quarters of a century. In his editions, Rampal transmitted the quintessence of his musical thought and of his view of Baroque music; thus, by studying them, we can appreciate the fundaments of Rampal’s aesthetics, and engage creatively with them in turn. These editions, arrangements and transcriptions, therefore, are not just a crucial document for the history of flute performance practice, but also a true artwork in itself, with which contemporary musicians can in turn interact in a creative fashion. Rampal’s performed and written interpretations are art; and so is the performance of these editions which this CD proposes to the musical world today. Alberto Ferro: Born in Italy in 1996, and achieved his Master's degree under the guidance of Prof. Epifanio Comis, his lifetime mentor, at the "Vincenzo Bellini" Institute of Music in Catania (2018). He also attended several piano masterclasses held by pianists such as Leslie Howard, Richard Goode and Jörg Demus. He won prizes in national and international competitions, including: 2nd Prize, International Press Prize and Haydn Prize at the "Ferruccio Busoni" International Piano Competition in Bolzano (2015); 1st Prize at the “Premio Venezia” National Piano Competition at Teatro La Fenice in Venice (2015); 1st Prize and Audience Prize at the International Telekom Beethoven Competition in Bonn (2017). He has performed many concerts throughout Europe: Teatro Malibran and Teatro La Fenice in Venice, Fazioli Concert Hall in Sacile, Sala Verdi of the Conservatory in Milan, Künstlerhaus and Herkulessaal in Munich, Philharmonic Hall in Liège, Concertgebouw in Bruges, Flagey and Centre for Fine Arts in Brussels, Philharmonie in Luxembourg, Gewandhaus in Leipzig, Beethoven Haus in Bonn, Meistersingerhalle in Nuremberg. In 2016 and 2017 he was awarded the Italian Chamber of Deputies Medal, personally offered by the President of the Chamber of Deputies, Hon. Laura Boldrini, on the occasion of the European Music Day, in recognition of his artistic talent and for the successes achieved in some prestigious international piano competitions over recent years. In March 2017 he gave a recital at the Pauline Chapel of the Quirinal Palace in Rome, for “I Concerti del Quirinale di Rai Radio 3” concert series, receiving many appreciations from the President of the Italian Republic Sergio Mattarella. Many of his recordings were broadcast by radio and television broadcasters in Italy and abroad. In 2016, the BNP Paribas Fortis engaged him for a concert series in Belgium and published a CD that includes some live performances of him from the “Queen Elisabeth” Competition in Brussels. Andrea Mogavero: Begins studying flute in 1992 after listening to the well-known French virtuoso Jean-Pierre RAMPAL, who becomes his principle guide and source of inspiration. He cleverly graduates at the “Tito Schipa” Conservatory in Lecce, Italy and then he specializes with the international soloists Andrea GRIMINELLI and Claudi ARIMANY. He collaborated with the great flutist Sir James GALWAY, with Massimiliano DAMERINI, Andrea GRIMINELLI, Claudi ARIMANY, Lady Jeanne GALWAY; with the canadian singer-songwriter Patrick WATSON, Vittoria YEO and the Luciano PAVAROTTI FOUNDATION. In 2009 he has been invited to study at the “Ecole Normale de Musique A. Cortot” in Paris, from the Maestro Shigenori KUDO. He has studied with important flutists as Jànos BALINT, Pierre-Yves ARTAUD and achieves the Degree in Musical Teaching Methodology at the “Nino Rota” School of Music in Monopoli, Italy; he got the Degree in Flute Soloist at the “G. Paisiello” Musical Institute in Taranto, Italy - studying with the flute teacher Angelo Malerba - and the Degree in Chamber Music. He attends “High Specializing Master for Wind Instrument Musicians in Soloist and Orchestras’ Repertoire” with Hans-Jörg SCHELLEMBERGER (1st Oboe at the Berliner Philharmonisches Orchester 1977-2001), Claudio Paradiso, Lorenzo Castriota Skanderbeg and Karl MARTIN. He studied opera singing with Vanna Massari CAMASSA – Tito SCHIPA’s pupil.